Whilst we visited other sites pretty regularly, one place we had neglected until very recently was Seaton Delaval Hall. It wasn’t until this summer that we called into Seaton Delaval Hall and realised how much they had on for kids and families. Over the six weeks holiday Seaton Delaval Hall has different family activities on each week. During the week we visited we made our own wands and watched a magic show as part of Illusions Week. It was a great day out, we all really enjoyed it. The magic show was on for about 40 mins and the kids were laughing the whole time. Illusions week is now finished but there are still some great family activities scheduled. Each weekday in the school holiday there is a make and do activity to take part in and then a performance to watch or interact with. This week (until Friday 17th) it’s drama week. Make your own puppets 11am until 1pm then in the afternoon watch Theatre Space perform their colourful and delightful tales. Monday 20th August - Friday 24th August is Circus Skills week. Make a cup and ball the on the afternoon try out some circus skills testers with the team from Circus Central. Mischief and Mayhem week (27th-31st August 20-8) will be a massive favourite with the kids as they can make their own slime!! Followed by Theatre Space making mischief in the Gardens. All of the activities are included in the daily admission fee (£7.20 for adults, under 5s FREE, children up until 16 £3.60) or the annual pass which works out at £10 per month for a family pass. In addition to the activities there is shedloads to do. The grounds are beautiful and perfectly sized for younger kids. Seaton Delaval Hall is one of the few National Trust sites that we don’t need to take the double buggy. The car park is located close to the Hall and gardens, and whilst there is loads of room to run around the site isn’t spread out with long walks between the different areas. Everything is pretty compact. 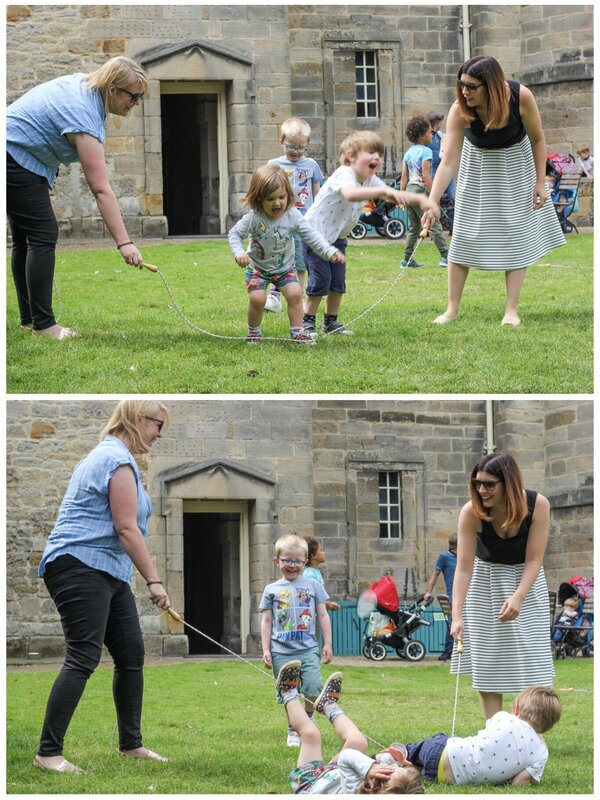 We loved all of the games available to play with and got stuck in with the skipping rope (we definitely need a few more lessons as the kids were clueless as to how to skip), skittles, dominoes, swing ball and the kids’ favourite the toy horses. We spent ages on the grass with these. There was sports equipment on the bigger field which we didn’t use, but looked to be a big hit with the older kids. Seaton Delaval Hall has really exciting plans for the future with Heritage Lottery Fund’s support which will see the Hall getting a. new café, toilets, and the biggie for us a spanking new play area. I was under the misconception that Seaton Delaval Hall didn’t have a play area which I think is why we hadn’t visited before, but actually the one they have, whilst small is perfectly formed. They have a wooden structure perfect for climbing and exploring, tunnels to climb through and a campfire area which is perfect for role play. We can’t wait until they get the new bigger style play park, but in the meantime there is plenty to entertain kids. The weather wasn’t on our side on the day we visited so we ended up missing out on quite a few of our plans when it started raining. There are four model sheep within Seaton Delaval Hall and we were going to find them all as a bit of a treasure trail. There are also 4 Geocaches within the grounds of Seaton Delaval Hall which we were going to look for. Geocaching is a finding game where you use a mobile phone app to find a GPS location where there will be a box with ‘treasure’ in. The idea is that if you find the box and take whatever is inside, usually a trinket or sweet, then you replace it with something else for the next person to find. We’ve never tried Geocaching before but Here Come The Hoopers have written a post about how much they love it here. We’ll have to wait until a drier day to try and find the ones at Seaton Delaval Hall. All in all we had a really lovely day. We were there for over 3 hours and would have stayed longer if it wasn’t for the weather. We’ll definitely be back this summer, once the kids know about slime making I don’t think we’ll have any choice in the matter! What is your favourite local National Trust? Are there any other hidden gems we might have missed?